The celebrated spa is well-known as a place that has succeeded in preserving the atmosphere of the Edo era. 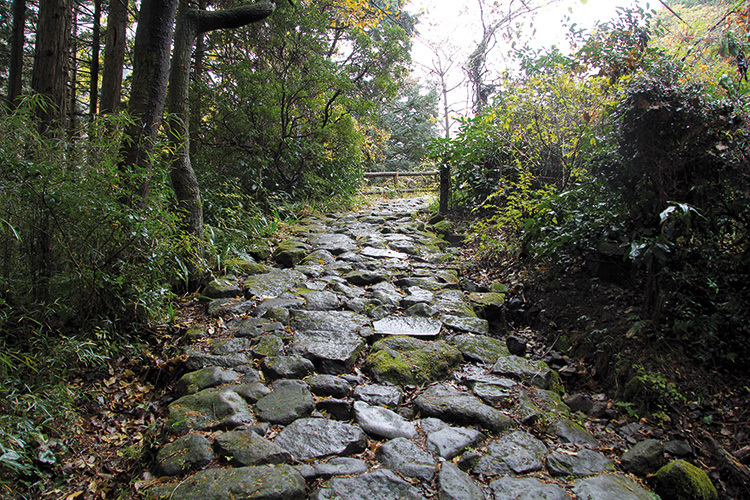 For two and a half centuries, Sakaichi-zake and its irregular paving stones was the only way to get to Kyoto. Built 400 years ago by the Tokugawa shogunate (military dictatorship) to defend Edo, the Hakone checkpoint (sekisho) located beside Ashinoko Lake was one of the largest at the time. Anyone attempting to travel illegally was liable to incur the death penalty. “It even included an execution chamber. It was a radical solution, which was very rarely used by the authorities, but it was there. In the registers we found 5 cases of people condemned to death.” once this checkpoint had been negotiated, it was time to take a deep breath and rest awhile before continuing on the long route to reach kyoto. Travellers were able to relax along the journey at the charming little teahouses where they could eat something and warm themselves up. The history of the Hakone region would not be complete if we omitted its famous hot-water springs. The spa’s very first bath house opened in the Nara period (710-794), and the famous Seven Hot Springs of Hakone would have particularly appealed to the crowds during the Edo period, due to the growing reputation of their therapeutic merits. After the Restoration of Meiji, the bathhouses increasingly developed. as they benefitted from better access. The owners of traditional inns invited the best architects in the country in order to renovate their buildings and transform some of them into wooden buildings several storeys high. This happened to Bansuiro Fukuzumi, which had been in existence since 1625. It draws its water from the oldest hot spring in Hakone. FUKUZUMI Haruhiko, its director, agrees to take us to see this famous spring, however, we’re not allowed to film or photograph it. Behind a double- padlocked iron door leading to the interior of the rock, the heat from the volcanic water rises and warms our cheeks. “It’s best to climb down the ladder and get closer to see it,” he smiles. The walls of the cave are hot and moist as we approach the water of this spring, which is now just a few metres below our feet. Here, in the palm of one’s hand, is water that’s almost 50°C and has been curing physical ailments for centuries. FROM TOKYO, the easiest way is to take the Odakyu line from Shinjuku to Hakone-Yumoto. For a journey to remember, think about travelling on the Romancecar express train (75 minutes, ¥2280/£15.70), a Japanese railway legend. The company also offers several other lowpriced options.